Scholarship on the contemporary has a unique relationship to questions of canonicity and value. What values shape the choices that scholars of contemporary literature make in their research and teaching? What canons are we consciously or unconsciously producing in our work? Do we want scholarship on the contemporary to avoid the formation of canons and value-systems altogether? Or are there better ways of acknowledging, challenging and decolonising the biases implicit in our research and teaching? As co-founders of the Contemporary Studies Network, we’ve spent the last three years running reading groups and public events with the aim of discussing popular or emerging cultural theories that we might not otherwise “find time” to read. Indeed, our group began to help us as Early Career Academics prioritise texts that we’d already partly excluded, giving us a reason to read theories and theorists that we hadn’t got around to but that someone – somewhere – had told us we should. Our workshop for BACLS 2018 wanted to extend the concerns of our reading groups through the idea of canonicity, asking participants to discuss the literary and theoretical texts that they believed to be “essential” to students and scholars of the contemporary. Through a reading of Amy Hungerford’s now infamous “On Not Reading” (2016), in which she refuses to read David Foster Wallace, we also wanted to debate the institutional necessity of establishing a sense of canonicity in the field of contemporary literary studies and the right to refuse certain dominant cultural figures. Once again, we approached this idea with an eye on the job market, where ECAs are asked to translate the necessity of their field to academics whose specialism often has a much more rigid sense of its set texts. Yet, as Hungerford also claims, time and the economising of energy and resources are often what feel most at stake in the neoliberal university, emphasised at all career levels by growing workloads and an increasing reliance on ranking exercises as well as precarious or low paid contracts. Our workshop therefore hoped to reflect, however provocatively, on which contemporary texts we deemed essential, to survey which authors had fallen out of favour, and to satisfy a genuine curiosity about which texts our colleagues and contemporaries prioritise and which they would, as we discuss below, assign to the bin. Photo of workshop at BACLS 2018. In practice, the workshop attracted 35 participants – a group that nicely reflected the diverse cohort of scholars, subdisciplines and research areas represented at BACLS 2018. We began the session by reviewing and discussing the Hungerford piece, an essay that became part of a chapter in her recent book Making Literature Now (2016), and which incidentally we had spent some time puzzling over ourselves. Though some of its premises were challenged, many of our participants found at least parts of Hungerford’s argument persuasive, particularly in relation to her reasons for “not reading” which she outlines as a “small act of countercultural scholarly agency” (“On Not Reading”) that might reclaim a degree of academic autonomy. A rich debate then ensued about why we might disavow authors or texts that others see as seminal or important. Some felt that such acts of refusal would be tantamount to a kind of censorship or “no-platforming” while others noted that such acts might be necessary in the wake of #metoo, to name just one example. This discussion segued nicely into a small group exercise designed to think about specific authors and texts that participants might like to decanonise or “not read” and, conversely, those that they see as essential to a general survey of contemporary literature. Part of the session was intended to be fun – we created a “bin list” to which attendees submitted anonymously, an exercise that produced several unexpected names and some debate on Twitter. However, the “bin list” – or rather, protestations about who was on it – also proved to us that some authors are undoubtedly held up as essential even or perhaps especially when we avoid canonisation. Overall, what took place was a nuanced and interesting debate about how and why we canonise, what other forms of coherence we might rely on in the broad discipline of contemporary literary studies, and whether or not coherence is important to the field. One final notion that emerged was the sense that, rightly or wrongly, there is a kind of canon of contemporary contexts and themes that academics regularly return to. Even as the authors or texts that are studied and taught range wildly, many people are teaching or working in areas such as the digital, identities, social movements, events, or neoliberalism – topics which organise texts around similar principles. At the conclusion of the session it felt as though some exciting ideas had been articulated, with energy starting to emerge from broader questions about literary value and hierarchy, scholarly precarity and Hungerford’s privilege – as a tenured professor – of having the status to refuse work, course design and the refusal of texts on political grounds, all stemming from the foundational idea of canonicity. Since the success of the workshop at BACLS 2018, we decided to take the show on the road. In collaboration with Kevin Brazil and Andrew Dean, we will continue our discussion of contemporary canons and value-systems by asking similar questions about canonicity, value, and refusal at further workshops held around the UK. Our first event will take place at the University of Southampton in June 2019 (exact date and details TBC). Importantly for us, the attendance of postgraduate and precarious ECAs at this event will be supported through BACLS travel bursaries and we look forward to seeing many readers of Alluvium there – or at our future workshops at the University of Birmingham, UCL, and Edinburgh Napier University. We are particularly excited to support the attendance of postgraduates and precarious ECAs as we strongly believe both in the importance of keeping our events accessible to scholars without access to institutional funding and in including discussion of new and emerging textual approaches and course design from postgraduate level on. In addition to workshopping our ideas through collaborative practice and discussion, some of these events will be inviting individual responses to the question of contemporary canonicity through flash-papers and posters. 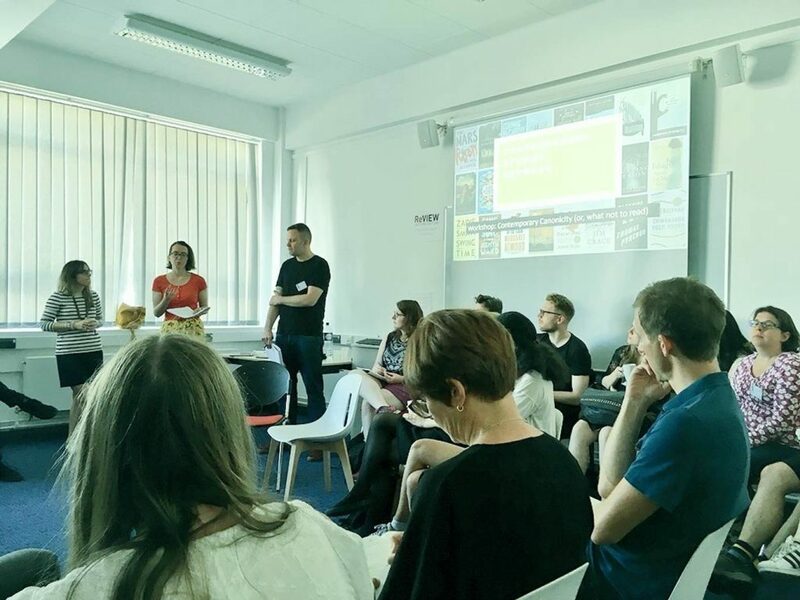 We are particularly interested in the pedagogical applications of these workshops and the questions they generate and hope that the discussions fostered by our events can help shape curricula, in academia and beyond. Diletta De Cristofaro is a Teaching Fellow in English Literature at the University of Birmingham. She researches twenty-first and twentieth-century North American and British fiction. Her main research interest is the nexus of narrative and time, with a particular focus on the contemporary post-apocalyptic novel. Arin Keeble is a Lecturer in Contemporary Literature and Culture at Edinburgh Napier University. His research focuses on the literary and cultural response to terrorism and disaster. It is driven by a belief that through analysis of the ways texts represent, undercut and/or reinforce the official narratives of terror and crisis it is possible to move beyond often limited and reductive understandings of these phenomena. Rachel Sykes is a Lecturer in Contemporary American Literature at the University of Birmingham. Her research and teaching focuses on three areas: 1) sound studies and aesthetics of quiet and loud in American culture, 2) memoir and contemporary life-writing, and 3) digital and popular cultures. Hungerford, Amy. “On Not Reading.” The Chronicle. 11 September 2016. https://www.chronicle.com/article/On-Refusing-to-Read/237717. Debates about “not reading” hypothetically range from distance and surface reading to decolonisation and no- platforming but our session focussed on the uses of choosing or refusing to read dominant contemporary authors, sometimes as a performative and/or political act: see Piepenbring 2015, Solnit 2015, Liming 2017, Emre 2018.